The H+K London team continues to work with OTT Sports Broadcaster DAZN as it continues to rip up the rule book and disrupt sports broadcasting. One of the major sports that DAZN broadcasts around the world is boxing, thanks in part to a strategic partnership with Matchroom Boxing that sees DAZN subscribers access massive fights for no additional cost to their subscription. 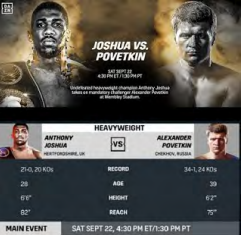 September was a huge month for Matchroom/DAZN, with their superstar fighter Anthony Joshua taking part in a heavyweight mega-fight against challenger Alexander Povetkin. The H+K team was out in force at London’s iconic Wembley Stadium for the big fight, hosting media and helping spread the word of DAZN’s growing global influence. The team recruited a great selection of journalists including from the FT, Daily Telegraph, Bleacher Report and Forbes to attend the fight and speak to key DAZN spokespeople. It was a great opportunity to engage journalists and led to the team picking up valuable insights and growing key relationships. He made history. So did we.